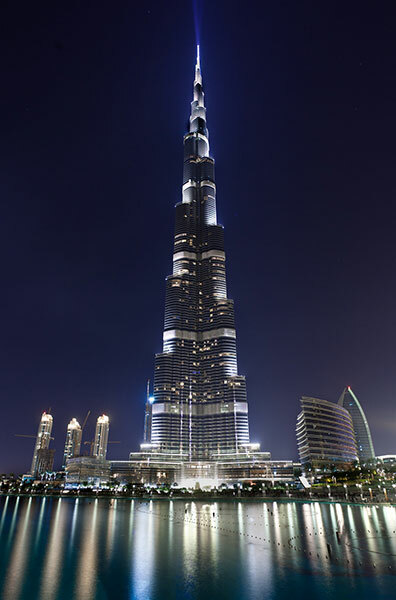 Dubai is proud with another wonder of the world: the tallest building ever built: 828 feet. It is a giant skyscraper of 1.5 billion dollars, which thus becomes the new symbol of the emirate. The Dubai Mall is a gateway for those wanting to visit the world’s tallest free-standing structure, Burj Khalifa standing at a staggering 828m. At the Top, the world’s highest observation deck on the 124th floor is accessible from the Lower Ground of The Dubai Mall, and offers guests 360 panoramic views of Dubai’s skyline. The Dubai Mall is the world’s largest shopping, leisure and entertainment destination. Located in the heart the prestigious Downtown Dubai, described as ‘The Centre of Now,’ is The Dubai Mall, the world’s largest shopping and entertainment destination and the world’s most-visited shopping and leisure destination, which welcomed more than 65 million visitors in 2012 and over 38 million visitors in the first six months of 2013. The Fashion Avenue, a 440,000 sq ft fashion precinct dedicated to high fashion, positions The Dubai Mall as the fashion capital for the region. Another niche component of the mall is The Souk, an elegantly designed precinct featuring jewellery shops, accessory outlets, traditional Arab clothing and handicraft stores, among others. One of the mall’s unique precincts is an open-air streetscape, The Village that offers a rich collection of denim brands and brings an outdoor community feel with tree-lined walkways, cafés and restaurants. The Dubai Mall features the world-class Dubai Aquarium & Underwater Zoo featuring over thousands of aquatic animals and a 270-degree walkthrough tunnel. The strong family entertainment components include KidZania®, an innovative children’s ‘edutainment’ concept; SEGA Republic, a 76,000 sq ft high adrenaline indoor theme park; the 22-screen Reel Cinemas megaplex with a total capacity of 2,800 seats; and the Olympic-sized Dubai Ice Rink. For visitors, there is an adjoining 5-star premium hotel, The Address Dubai Mall and car parking for over 14,000 vehicles. A massive expansion of The Dubai Mall is currently underway, paving the way to welcome over 100 million visitors. Within the first phase expansion by 1 million sq ft, the fashion portfolio of the mall with be strengthened, enhancing the city’s high end retail offerings and further catering to the international demographics of Dubai’s tourists. Souk Al Bahar (‘market of the sailor’) is an Arabesque shopping, entertainment and dining destination located in the heart of Downtown Dubai. Easily accessible through a stunning walkway from modern Dubai Mall, Souk Al-Bahar transports the visitor into ancient Arabic heritage and community. Its over 100 shops include 22 restaurants, cafés and lounges, mostly located along the souk’s extensive waterfront promenade overlooking the majestic Dubai Fountain and the world’s tallest building –the Burj Khalifa. A visit inside Souk Al-Bahar is an experience in itself. Natural stone corridors, high archways, subdued lighting and arabesque decors of rhythmic linear patterns contribute to its charm. Its alleyways are lined with various shops – an eclectic mix of authentic handicrafts, jewelry, fashion wear, perfumes, carpets, furnishings, sports items, books; and the conveniences of modern times- from groceries to exchange houses. The combination of tradition and heritage, convenience, superb location, and exquisite dining experience makes Souk Al Bahar a vibrant waterside must-see destination. Set on the 30-acre Burj Khalifa Lake, the fountain shoots water jets as high as 500 ft (150 meters), equivalent to that of a 50-storey building. The fountain is 900 ft (275 meters) long and has five circles of varying sizes and two central arcs. It has been designed by California-based WET, the creators of the Fountains of Bellagio in Las Vegas. The Dubai Fountain performs daily, with the performance repertoire including Sama Dubai; Baba Yetu, an award-winning song in Swahili; the Arab world’s top-selling dance number Shik Shak Shok; and the signature piece of world-renowned Italian tenor Andrea Bocelli, Con te partiro (Time to Say Goodbye). Over 6,600 WET Superlights – the most advanced incandescent large fountain lights available today – and 25 colour projectors create a visual spectrum of over 1,000 abstract attractions. The beam of light shining upward from the fountain can be seen from over 20 miles away, and will be visible from space making it the brightest spot in the Middle East, and quite possibly in the entire world. • Set in Burj Khalifa Lake, right outside The Dubai Mall on Lower Ground Waterfront Promenade in the heart of Downtown Dubai. See it to believe it. Get whisked around the world’s most prestigious square kilometer and discover the new heart of the city with The Boulevard Bus Tour. With the specially designed bus, visitors can take clear and unobstructed pictures of the breathtaking sights of Downtown Dubai. At a fantastic price of only AED 10 for a daily pass, you can hop on hop off at your own leisure and experience the best shopping, entertainment and tourist attractions that Dubai has to offer. The Boulevard Bus Tour really is the only way to discover ‘The Centre of Now’, one icon at a time. The air-conditioned Boulevard Bus is the most convenient and comfortable way to tour Downtown Dubai. With 11 stops along the way, covering the whole of Mohamed bin Rashid Boulevard, visitors can marvel at the architectural wonders that are famous the world over. Set sail on the ultimate ride and enjoy front row seats to the world’s largest performing fountain. With the iconic Burj Khalifa as your backdrop, hop aboard a traditional Abra and enjoy the breathtaking sights and sounds.